Los Carpinteros, Faro tumbado [Felled Lighthouse], 2006. Mixed media, American Fund for the Tate Gallery, Courtesy of the Latin American Acquisitions Committee 2006. © Los Carpinteros, photo courtesy of the artists. 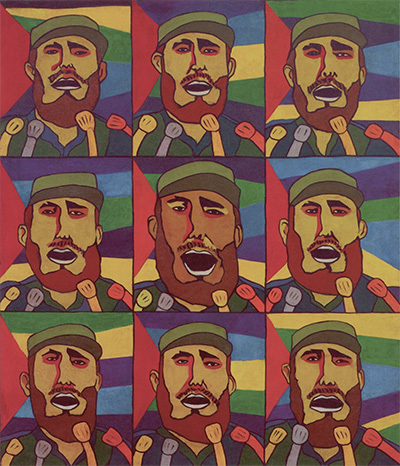 Raúl Martínez, 9 Repeticiones del Fidel con Micrófono [9 Repetitions of Fidel with a Microphone], 1968, oil on canvas, Col. Wallace Campbell, Jamaica. © Archivo Raúl Martinez. Late modern and contemporary Cuban art has gotten increased international exposure in recent years thanks to improved relations between the United States and Cuba, laying the groundwork for the Museum of Fine Arts, Houston’s unprecedented exhibition Adiós Utopia: Dreams and Deceptions in Cuban Art Since 1950. But Donald Trump’s arrival in the White House has given rise to uncertainty about continuity (or the lack thereof) in U.S. foreign policy, suggesting the show may not be debuting a minute too soon. 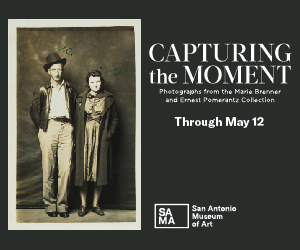 “We’re desperate for it to open so it doesn’t get closed down or anything of the sort,” quipped Mari Carmen Ramírez, the Wortham Curator of Latin American Art at the MFAH, where the show will be on view March 5 through May 24. Fortunately, she added, most of the works traveling from Cuba are already safely in Miami, while others are coming from U.S. or European collections. 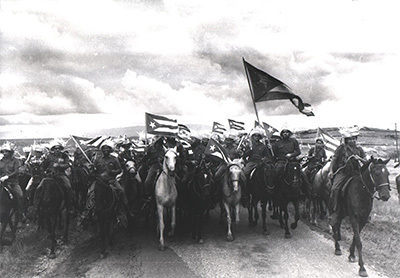 Raúl Corrales, La caballería [Cavalry], 1960, gelatin silver print, Couturier Gallery, Los Angeles. © Estate Corrales (courtesy Couturier Gallery, Los Angeles). Perhaps counterintuitively, the exhibition’s six thematic sections kick off with works by members of Cuba’s lesser-known “Concrete” art movement, which from the late 1940s on sought to make a clean break with Cuba’s dominant figurative tradition. While many of the artists’ shared concerns with those of the Argentine Madí group and its Parisian counterparts give their works an internationalist aesthetic, more organic abstractions by artists like Pedro de Oraá subtly infuse constructivist visual language with Afro-Cuban influences, Ramírez said. The next section shows the early development of Cuban revolutionary iconography and how, in later decades, artists reinterpreted that imagery. Even during the revolution’s early years, “you have people who, on the one hand, are completely engaged (with its goals), but, on the other hand, people who are engaged but see things happening that don’t match what is supposed to happen,” Ramírez said. 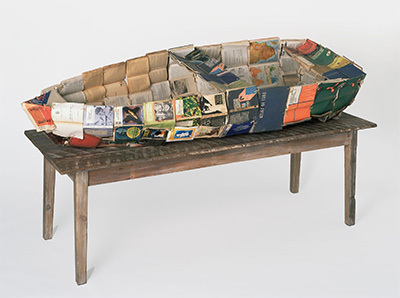 Kcho (Alexis Levya Machado), Obras escogidas [Selected works], 1994, books, metal frame, wood table, newspaper, twine, Walker Art Center, Minneapolis. 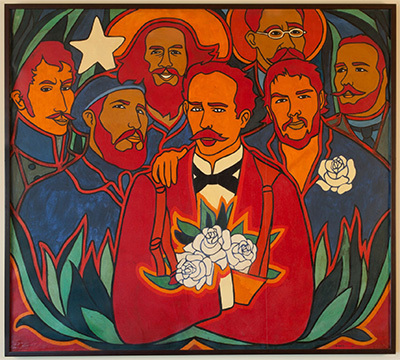 Even Cuba’s government-sponsored, internationally influential poster movement, the subject of Adiós Utopia’s third section, enjoyed “absolute freedom, and it became a real testing ground for innovation, both from an iconographic point of view and in terms of techniques,” Ramírez said. The show includes fifty examples from 1960 to 1972, the so-called “Golden Age” of Cuban poster design, and includes posters promoting music, literature, and cinema, as well as political aims. “In the 1970s, however, Cuba becomes closer to the Soviet Union and there is an attempt to establish official guidelines for art,” Ramírez said. “But they ran into problems from the very beginning, and they were never really able to enforce them. So artists had relative freedom in Cuba. If they were marginalized, they were marginalized because people would just not talk about them; they were left to languish.” That’s what happened to Antonia Eiriz, who in 1964 was dubbed “the Cuban Goya” by Gàmez for her menacing, expressionistic canvases, only to become so marginalized she stopped painting for twenty years, Ramírez said. Raúl Martínez, Rosas y Estrellas [Roses and Stars], 1972, oil on canvas, Patricia & Howard Farber Collection, New York. © Archivo Raúl Martinez. 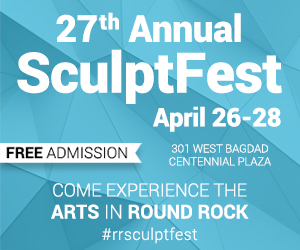 The fourth section presents artworks addressing the centrality of rhetoric and discourse to revolutionary ideology—a byproduct of the late dictator Fidel Castro’s reputation as an inexhaustible orator—as well as themes related to censorship and media controls. A number of allegorical works use mouths and tongues as metaphors for limits on dissent, while José Ángel Toirac’s 2005 video installation Opus features clips of Castro’s speeches delivering barrages of statistics meant to quantify the revolution’s progress. Works in the fifth section address the mass migrations from Cuba to the U.S. that have occurred in recent decades, particularly after the collapse of the Soviet Union, the island’s main trading partner. Tonel’s 1989 installation The blockade features a set of cinder blocks in the shape of Cuba, calling attention both the U.S. embargo and to Castro’s using it as an excuse to avoid reforms. The final section presents works from the past four decades that have given voice to artists’ disillusionment with utopian dream the revolution represented. For Ramírez, two works by the collective Los Carpinteros are particularly emblematic. 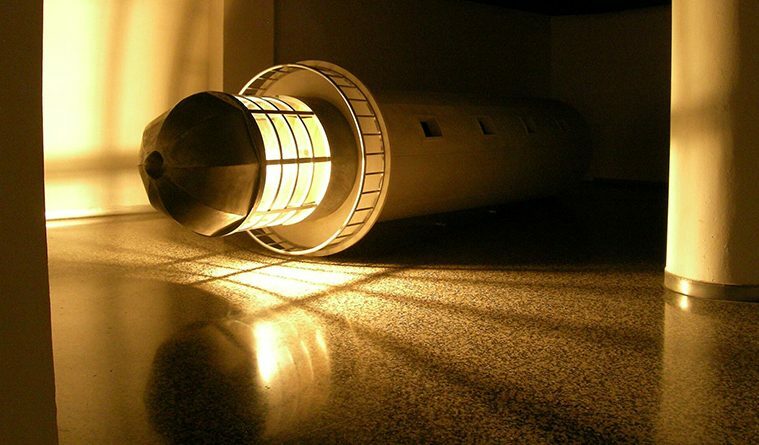 Felled lighthouse (2006) reconstructs a national monument, the iconic Morro Castle lighthouse in Havana, but dims its light and lays it on its side. The 2012 video Irreversible conga features a procession of hundreds of dancers, but instead of wearing the traditionally colorful attire associated with the Cuban carnival, they’re dressed in black. And instead of going forward, they’re moving backwards.